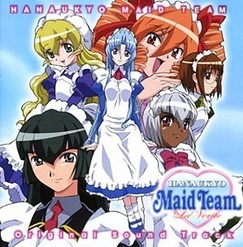 Beautiful maids galore and beautiful, regal melodies go together hand-in-hand in the "Hanaukyo Maid Team~La Verite Original Soundtrack," featuring 26 playful instrumental tracks laced with prominent strings, flute, sax and piano led by composer Michiru Oshima (Magic User's Club, Fancy Lala, Arc the Lad). From the smooth sway of the warm opening theme song, "Voice of heart," performed by "Chobits" and "Hanaukyo Maid Team~La Verite" voice actress/vocalist Rie Tanaka, to the bubbly ending song, "I'll Serve You! ", this gentle soundtrack fully encapsulates the musical elegance and charm of this new anime series. The soundtrack to the maid-theme comedy series available on DVD from Geneon Entertainment featuring an opening theme sung by popular voice talent/singer Rie Tanaka (Gundam Seed, Chobits, Azumanga Daioh, .hack//SIGN, Dual!) as well as a full-color insert booklet with lyrics, song titles, a composer profile translated into English and romanized lyrics.